Long-time volunteer Julie Halfnights at Thompson Community Centre. Julie Halfnights supposedly ‘retired’ four years ago. But that’s clearly a misnomer. The longtime Richmond community activist is as busy as ever volunteering, and generally trying to make the world a better place. Halfnights’ reputation is both well-earned and deeply-rooted. Her parents, both immigrants to Canada in 1955, faithfully gave of their time upon settling in Chilliwack. It was a lifelong commitment until their health failed. Working in the service of others was one of Halfnights’ first and most vivid memories of her parents. Rob Howard, himself a well-known and respected community activist, has known Halfnights for close to 20 years—since he served as a Richmond city councillor in the 2000s and later as an MLA in the provincial government. Howard also appreciates Halfnights’ unwavering dedication to whatever task she’s taken on. Both Halfnights’ parents were members of numerous community groups. Her mom volunteered with the Chilliwack Community Services, Cheam Figure Skating Club and the city’s centennial celebrations, while her dad was an auxiliary police officer for decades and active in local politics volunteering on behalf of several MLAs and MPs. An active child, Halfnights became very involved in her high school serving on student council, athletic council, as a basketball coach, a tutor for local Indigenous children and as a high school rep to the local Miles for Millions Walk, a sponsor-based fundraiser for safe water supply in developing countries. She later volunteered while at BCIT, a practice that continued after her children were born and now that they are grown. While there are of course many reasons people choose to volunteer, Halfnights says there are many services that directly depend upon volunteers. Meals on Wheels, sports coaches, RAPS pet services and drivers for cancer patients immediately come to mind, as to those who visit invalids. There are also causes and issues, she says, that need people to speak up in order that changes are made. As part of the modular housinggroup’s community advisory committee, Halfnights sees services like grants and scholarships, and how they make huge differences in the lives of Richmond citizens. 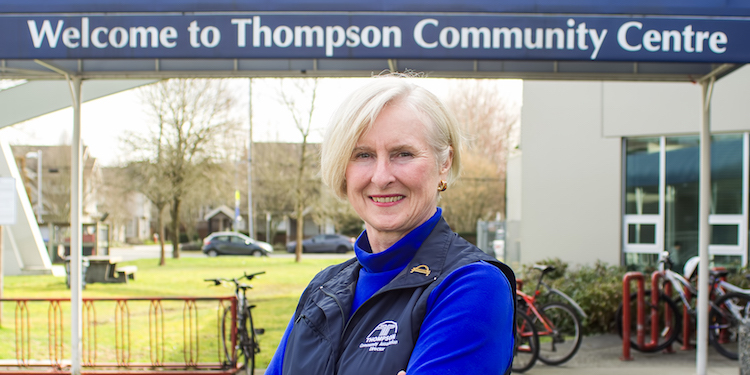 At Thompson Community Centre, where Halfnights is a longtime member and has served in many capacities including at present as a director, she and colleagues saw—and responded—to the need for English-as-a-Second-Language pre-school 30 years ago. Through their efforts, adapted fitness for people with disabilities was started 15 years ago, and for the Mother Goose parent-child bonding programs more recently. She likens Thompson Community Centre to a second home, pleased that her work there benefits people daily. She feels “incredibly fortunate” to have physical reminders of her involvement in the new Thompson Community Centre, Blair Elementary and Burnett Secondary, having sat on building committees for all three in the 1990s. Apart from what she can do for others through volunteering, Halfnights says it allows her to meet and get to know people from a broad range of backgrounds and cultures. And it keeps her mind nimble. Halfnights encourages everyone to volunteer.